There are many uses for toothpaste besides just cleaning your teeth. Toothpaste is one of the items we score FREE or Cheap with coupons. I know I always have a bunch in my stock. 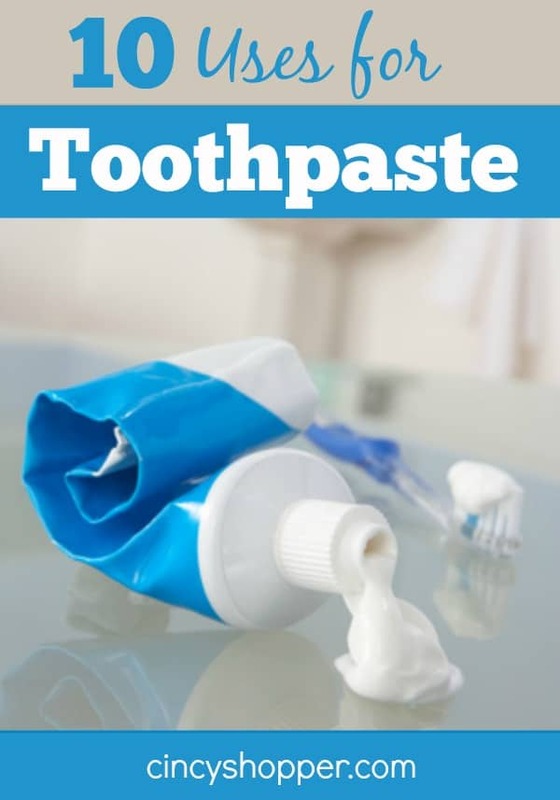 Toothpaste can be used around the home in many different ways. Here are 10 ideas for you to consider using toothpaste instead of for just brushing. 1. Drywall Holes: Holes left in the wall from picture frames, curtain rods, etc.? Spackle them with a little toothpaste, just dab a little in and smooth. 2. Shoe Scuffs: Nothing is better than a brand new pair of sneakers, that is until you scuff them. Don’t worry though you can fix any scuffs in the rubber with some toothpaste and a little elbow grease. 3. Clean Your Iron: Believe it or not, toothpaste can get the gunk right of your iron. Just dab a little toothpaste on to a cool iron and scrub off. 4. Jewelry Polish: If the metal on your jewelry and watches is tarnished or dirty, work some toothpaste into a dry cloth and rub onto the metal then rinse. It’ll look as good as new! 5. Easy Sink Cleaning: If you’re like me, there’s been numerous times where you’ve brushed your teeth and managed to dribble some toothpaste out of your mouth or off your brush all over the sink. Instead of making cleaning harder, this can actually help keep your sink cleaner in between regular cleaning times. Just rub the excess toothpaste all around the sink, the basin, drain, and faucet especially. 6. Scratched Discs: If we had known about this trick sooner, we probably would’ve saved so many video games when the boys were younger and had a habit of leaving them everywhere but their cases. Take a small dab of toothpaste to the scratched side of the disc. With a soft, clean towel, rub the toothpaste all over the disc in circles. Wipe any remaining toothpaste off with a slightly dampened towel. No more skipping music, movies, or video games. I mentioned this trick in my other post Ways to Fix a Scratched DVD. 7. Blemish Blaster: Problem pimple you need gone fast? Dab some toothpaste on to the blemish before bedtime and let it sit. In the morning, your pimple should be shrunk in size and less red. 8. Crayon on the Wall: Sometimes kids like to make beautiful crayon drawings all over the wall. Don’t worry, you can take a damp cloth and a little toothpaste and rub it into the artwork. Rinse with a clean, wet cloth and dry. 9. Baby Bottle Cleaner: Remove sour milk smell easily by scrubbing your bottles with a mixture of water and toothpaste. Repeat multiple time if needed and rinse thoroughly with water. 10. Leather: Clean up any leather bags, coats, shoes, etc. with some toothpaste. Dab onto leather scuffs, work in with a soft cloth, and rinse with a dampened cloth.